I needed to make a quick gift - my card box holds 6 cards and envelopes. I used my C-30 DIY Round Monogram Stamper (1-3/16" Round) to create my monograms along with the Damask border - it matches my retired Brocade Backgrounds DSP. I am just sooo glad that I've ordered that monogram stamper (along with numbers and the tiny letters) last week. Now you make me antsy to get it in the mail...with seeing all your great stuff you are making with it. 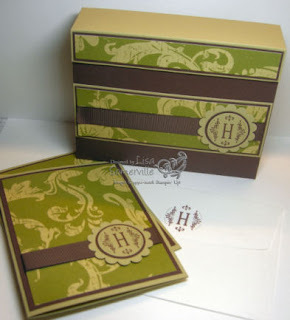 love this set, guess I can't put it off any longer, time to order the Monogram stamper!